The Initiative's annual report provides an overview and highlights of key programming during the 2017-2018 academic year, such as a national Convening on Overcoming Polarization Through Catholic Social Thought and a series of Dahlgren Dialogues with Georgetown's Office of Mission and Ministry. 2018 marks five years since the founding of the Initiative on Catholic Social Thought and Public Life. Since the Initiative began, it has organized more than 40 gatherings attended by more than 18,000 people, demonstrating there is a hunger for civil dialogue and moral conversation in public life, for the values of Catholic social teaching, and for the message of Pope Francis. Engaged the campus community with three Catholic Social Thought Fellows;assisted the university and its board to adopt and apply socially responsible investing policies; held a student session on faith, work, and life after Georgetown;and taught undergraduates in a seminar on Catholic social teaching. 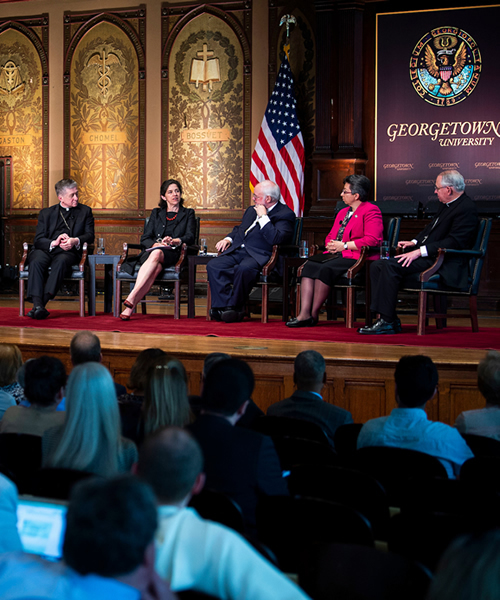 Over the years, the Initiative has grown from a promising idea to a respected place of civil dialogue in a divided Capital; a place for leaders to come together across political, ideological, and ecclesial lines to build bridges and advance common principles; and a unique source of encouragement and formation for young Catholic public policy and Latino leaders in Washington. This past year has demonstrated that the Initiative’s distinctive mission of civil dialogue, encouragement of young leaders, and principled participation in public life is more important than ever. We are very grateful.